Winner of the 2014 New Pulp Award for Best Novella! When we last saw Patricia Wildman, daughter of Doc Wildman, the bronze champion of justice, six months had passed since the main events of The Evil in Pemberley House. She and her associate Parker, an ex-Scotland Yard Inspector, had set up Empire State Investigations at her Pemberley House estate—and she just received a mysterious phone call from her supposedly late father . . .
Several months later, Pat receives a visitor, a young girl named Emma Ponsonby, whose father, a British diplomat to a small Central American country, has been kidnapped by the Scarlet Jaguar. Pat, following in her father’s footsteps of righting wrongs and assisting those in need, agrees to help, but before they can set off on their quest the Scarlet Jaguar sends a gruesome warning. Undeterred, the investigation takes Pat, Parker, and their young charge from Pemberley House in the Derbyshire countryside . . . To New York, where they battle agents of the Scarlet Jaguar and meet Pat’s old friend, the icy, pale-skinned beauty Helen Benson, who agrees to join them on their quest . . . To the small nation of Xibum, where the Scarlet Jaguar’s reign of uncanny assassinations threatens to expand to the rest of Central America—and beyond! Now, it’s a race against time deep in the wilds of the Central American jungle, as Pat Wildman and her crew search for Emma’s father, and confront the Scarlet Jaguar’s weird power to eliminate his enemies from afar, marked only by a wisp of crimson smoke—smoke resembling nothing so much as the head of a blood-red screaming jaguar. But who—or what—is the Scarlet Jaguar? A power-mad dictator determined to reclaim power? A revolutionary movement bent on taking over the country, and the rest of Central America? Or a front for something even more sinister . . .? Win Scott Eckert is an author and editor, best known for his work on the literary-crossover Wold Newton Universe, created by author Philip José Farmer, but much expanded-upon subsequently by Eckert and others. He holds a B.A. in Anthropology and a Juris Doctorate. Eckert is editor of—and contributor to—the 2005 MonkeyBrain-published work Myths for the Modern Age: Philip José Farmer's Wold Newton Universe (originally titled: Creative Mythography: An Expansion of Philip José Farmer’s Wold Newton Universe), collecting Farmer's little-seen stories and essays which expand upon the Wold Newtonian concept, alongside "contributions from Farmer’s successors—scholars, writers, and pop-culture historians—who bring even more fictional characters into the fold". Myths for the Modern Age was a 2007 Locus Award finalist for best non-fiction work. In 2006, he wrote the foreword to Bison Books' new edition of Philip José Farmer's original Wold Newtonian work Tarzan Alive: A Definitive Biography of Lord Greystoke (Bison Books, 2006). Eckert's two-volume Crossovers: A Secret Chronology of the World (Black Coat Press, 2010) uses literary/film/TV crossovers between members of the core Wold Newton family and other fictional individuals to create an expanded shared continuity called the Crossover Universe. He is the coauthor with Philip José Farmer of the Wold Newton novel The Evil in Pemberley House, about Patricia Wildman, the daughter of a bronze-skinned pulp hero. 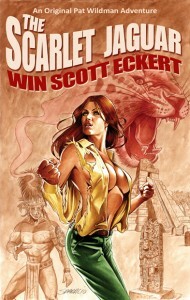 Pat Wildman’s adventures continue in Eckert’s sequel, The Scarlet Jaguar. He has coedited three Green Hornet anthologies for Moonstone Books, and his tales of Zorro, The Green Hornet, The Avenger, The Phantom, The Scarlet Pimpernel, Captain Midnight, The Domino Lady, and Sherlock Holmes, can be found in the pages of various character-themed anthologies, Tales of the Wold Newton Universe, and in the annual series The Worlds of Philip José Farmer and Tales of the Shadowmen. A Girl and Her Cat (coauthored with Matthew Baugh), a new Honey West novel, was released in 2014. A hardcover limited edition of The Scarlet Jaguar is due out in November 2015.